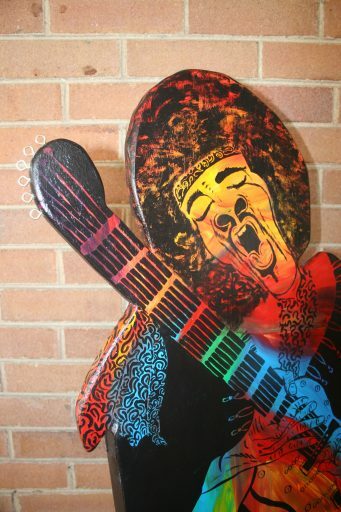 Although Jimi Hendrix’ mainstream career only spanned really four years, he is widely regarded as one of the most influential electric guitarists in the history of popular music, and one of the most celebrated musicians of the 20th century. The Rock and Roll Hall of Fame describes him as “arguably the greatest instrumentalist in the history of rock music”. And you know what, I have to agree. 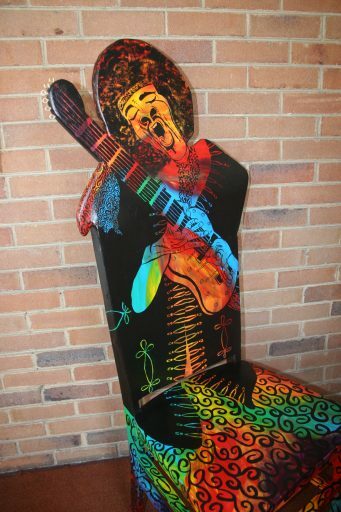 Hendrix played a variety of guitars throughout his career, with a few exceptions, Hendrix played right-handed guitars that were turned upside down and restrung for left-hand playing, pretty cool huh? This made the sound of his music as unique as he was. Hendrix’s music has received a number of Hall of Fame Grammy awards, starting with a Lifetime Achievement Award in 1992, followed by two Grammys in 1999 for his albums Are You Experienced and Electric Ladyland; Axis: Bold as Love received a Grammy in 2006. In 2000, he received a Hall of Fame Grammy award for his original composition, “Purple Haze”, and in 2001, for his recording of Dylan’s “All Along the Watchtower”. Hendrix’s rendition of “The Star-Spangled Banner” was honored with a Grammy in 2009. In 2015, our family was lucky to see some of his guitars, clothing and concert posters at an amazing exhibit paying tribute to him at the Museum of Pop Culture in Seattle WA. Then in 2017, our family enjoyed the Rock N Roll Hall of Fame’s permanent exhibit to him that includes: his Fender Stratocaster Electric Guitar and and Gibson Flying V, his priest’s robe from 1967, the jacket and pants frat he wore at the Love and Peace Festical in Germany in 1970 and more. Both of these exhbits are must sees for music lovers. So are you experienced enough to enjoy Jimi in a Purple Haze? Enjoy the site of psychedelic Jimi playing in your own home. This custom order was combined with my tributes to Elvis, John Lennon and Prince to form one of Rock’s greatest bands to never play.